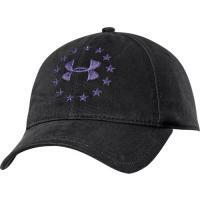 Under Armour Men's UA Freedom Snap Back Cap is a quality hat with a variety of features to keep you looking good and feeling comfortable. This cap with snapping back was designed to maintain its form without getting crumpled, and the crown includes an attached HeatGear® sweatband inside. With design like this, you never look unprofessional. You can find the perfect fit with the snap in back, adjusting the cap to your head size. Your purchase also benefits your colleagues, as UA donates a minimum of $250,000 per year to officers, soldiers, first responders, and veterans in need. Yes. yes. yes. wearing it everyday on my walks.